Maino wants respect. And that need to be respected has been earning him the ears of Hip Hop fans since 2003 through. 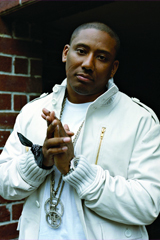 After becoming a breakout star on the mixtape and street DVD circuit, the Brooklyn rapper signed with Universal Records. Due to the usual politics and okie-doke, the signing only served as an obstacle instead of a blessing and the two parties parted ways in 2007.